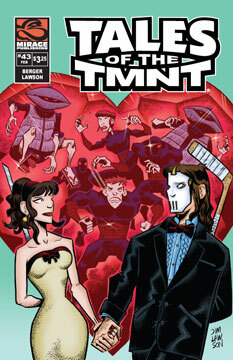 Casey’s no-good cousin Sid (from Tales of the TMNT volume one #1) has joined the Foot Clan as a lowly initiate. In order to advance his standing, the former thug leads Karai to the Jones family farmhouse in Northampton, Massachusetts to ruin Casey and April’s engagement party. The ninjas plan to steal the ring in Casey’s possession because Sid believes it to be the magical talisman that Karai is seeking.